← I meant to do that. Really! 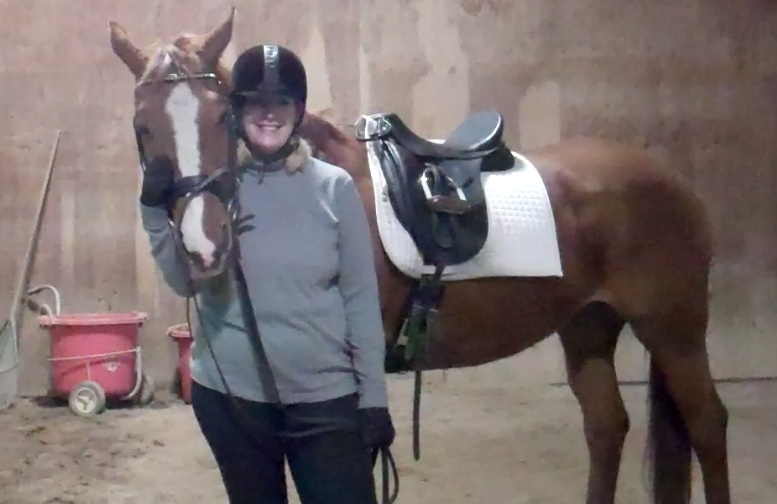 Atlanta and me, after my first lesson on her. 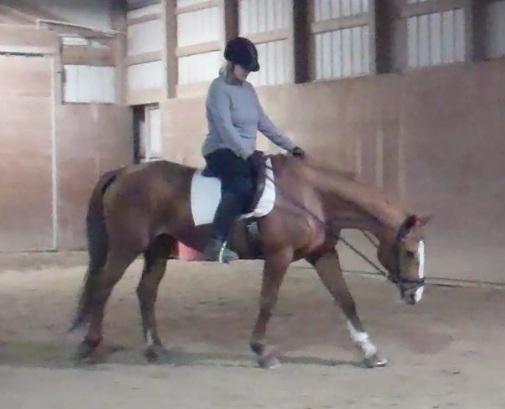 My friend Cathy just got a high powered job, and found herself insanely busy at about the same time I found myself horseless, and she offered me some saddle time on her fancy mare, Atlanta. I was thrilled and readily accepted. Atlanta has more training than any horse I’ve ridden. She’s a beautiful Hanoverian, and I’ve spent the last year admiring her from afar. 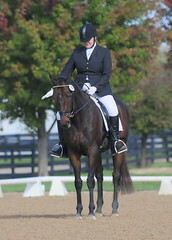 Cathy and Atlanta at their first dressage show last summer. I’ve not been in the saddle much lately, between my travel schedule for work, and getting sick. Between my fast-deteriorating riding muscles, and Cathy’s leather saddle (I’m used to my grippy suede Isabell) I had my work cut out for me. We walked and I worked on getting Atlanta to stretch into contact. After we warmed up, we started to trot. 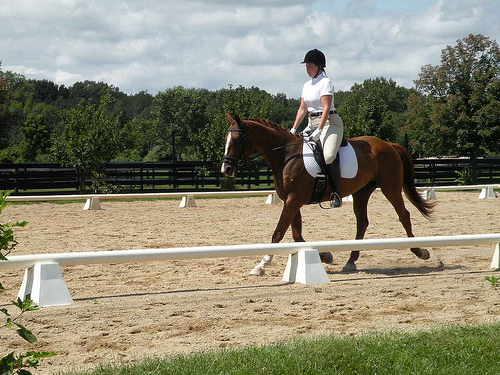 Christy warned me ahead of time that Atlanta’s gaits are different than the Thoroughbreds I’m used to riding. She has more suspension and is a bigger mover. The difference was immediately evident, even though I wasn’t asking her to really move. I had to post much bigger to stay with her, and her motion pitched me forward. I felt totally discombobulated trotting. I have a lot of work to do. 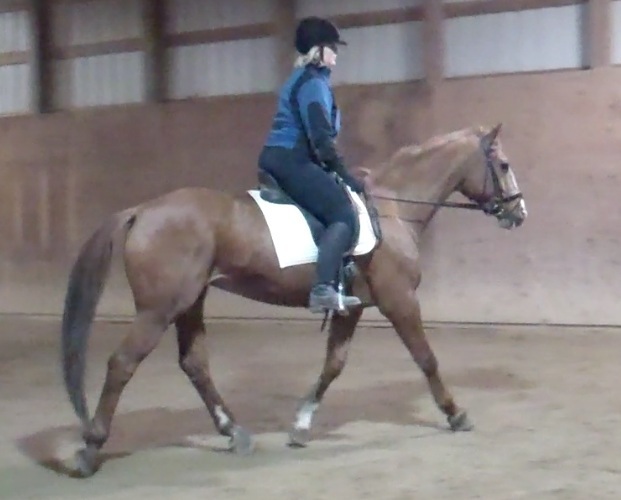 I hopped up into a two point to try to get my legs under me, and work on stretching down into my stirrups. It didn’t feel great, but Atlanta motored on. She’s a forgiving girl. We didn’t do much – I’m still getting over a sinus infection am not 100% – but it was a good ride, and a fun one. Two of my last three rides have been pretty high drama (a spill, and a bolt) so it was really nice to get on a horse I feel safe on. I’m taking another lesson on Atlanta this weekend and hope to have something more interesting to report. 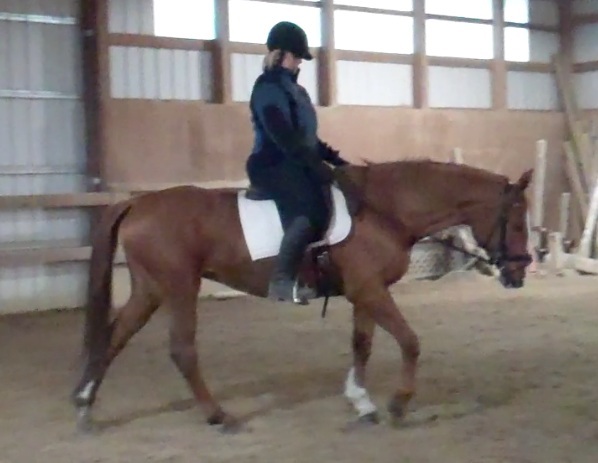 In the meantime, thanks again, Cathy, for letting me ride your wonderful mare! Yea! You can certainly help Cathy out by riding Atlanta, and I bet you two are a good match! She’s a good girl! When is your lesson? I’d love to watch you ride her! I’m not sure there’s too much to see at the moment, Liz – but I will let you know when the lesson on Saturday is. I’m also planning to ride her Sunday – maybe we can coordinate ride times? You looked really good on Atlanta! I’m glad you had a good ride. Just what you needed.